Here are 5 Tips for Perfect Wedding Music. It’s such a big day – no aspect of the wedding should be left to chance! We hope that these wedding music tips will give you some inspiration and confidence in booking. 1 – Work only with professional musicians. There are of course students who advertise themselves or are advertised. You may think that they’ll be just as good and reliable. Well they may be – or they may not. But would you hire photography students? Dress making or cake making students? No thanks! Well the same principle should apply to the entertainment. Experienced and reliable professionals are much more likely to do a great job. 2 – Concentrate on quality over quantity. You may think as long as someone is there and plays some music for several hours, that will do. But you don’t want them to be ‘part of the furniture’, like a waiter who’s there all day. You want them to be a feature of the wedding. Some of the best string quartets and London jazz bands for hire are more likely to charge the most if you ask them to stay for several hours. This is because they’re great at what they do and in demand. Many perform in 2/3 events on any given day, especially a Friday or Saturday. If you have a brilliant group, then it’s usually 2 – 3 hours max. They know that it’s much better that they finish and leave your guests wanting more, than to stay so long they no longer are noticed by anyone. 3 – Don’t do what you may have seen at other peoples’ weddings. We spoke to a couple recently who said they’d been to weddings where the DJ was ‘like a 21st birthday party one’ – cheesy and a bit naff. We know from experience that such DJs are not really professional wedding suppliers. They have a website and lots of bravado, but it doesn’t add up to much. By spending a bit more time and budget on a superb wedding covers band or wedding DJ, then you’ll be rewarded. It’s your day and you want the best you can afford. Pushing out the boat slightly can bring value. Value is when guests are saying ‘wow the DJ was amazing’ and ‘Everyone danced – even Uncle Tony!’ You’ve made an impact and your wedding will be all the better for it. Both for your guests and most important, for you! You could go bold and have some surprise opera singers or an amazing wedding gospel choir. Or even a visual DJ with huge LED drums for the evening entertainment! 4 – Book early and get everything in writing. Yes there are lots of entertainment acts out there. But the best ones tend to get booked earlier. Give yourself more choice by staying ahead of the game. Make sure you get a contract. Don’t rely on the email that says ‘Yes we have you pencilled in’. Some musicians may well pencil you in. But later on they may get offered another job and cancel on you. It’s something that we hate and don’t do here but it does happen. The artist you book should sign something that allows you peace of mind for one of the biggest dates of your calendar year and indeed your life. 5 – Go for music that you love (but remember friends and family!) When you’re at a wedding as a guest, you tend to take your lead from the Bride and Groom. If they’re relaxed and clearly having the time of their lives, then it’s easier for you to as well. When it comes to music – go personal. Choose what you love to listen to. But think of a broad range. 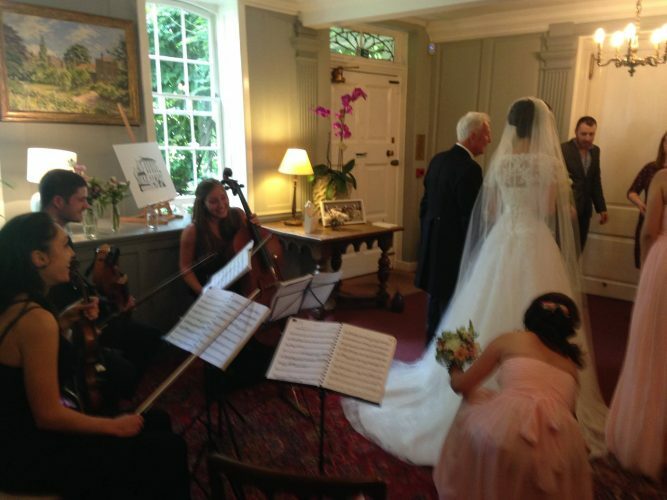 A great wedding band or DJ (or string quartet for that matter) will have a range of music. And that’s the spice of the wedding as well as life. True – you can’t please every guest but as long as the majority hear at least one tune that they love then you’re winning. Look out for acts with videos – live and/or pre-recorded. Then you get a great taste of what’s to come and it will be easier to feel confident in booking them. We hope that these wedding music tips will point you in the right direction. Contact us here at Liquid Strings for a friendly, no jargon chat about your music requirements for the special day.